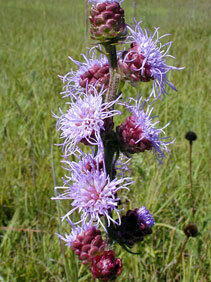 Also Called: Button gayfeather, button blazing star. Stems: Stiffly erect, 1 to several, unbranched, glabrous or short-hairy. Leaves: Alternate, simple, stalked, uppermost sessile, linear-lanceolate to linear, 2 to 8 inches long, .25 to 1.5 inch wide, often covered with resinous dots; margins entire; upper leaves reduced in size. Inflorescences: Elongate, spike-like, to 18 inches tall, with few to many well-separated heads; heads sessile or short-stalked, .5 to 1 inch wide; bracts purplish, wrinkled, glabrous, rounded at tips. Flowers: Ray florets absent; disk florets 16-40, rose-purple, corollas pubescent inside. Fruits: Achenes, pubescent, ribbed, brown, tipped with many barbed bristles, enclosing small seed. Habitat: Dry, open, rocky or sandy prairies. Forage Value: When in the early growth stage, tall gayfeather is grazed by livestock. Uses: Some Great Plains tribes of Native Americans used the boiled leaves and roots to treat intestinal pains. Comments: The name button gayfeather comes from the button-like appearance of the flower heads prior to blooming. It is sometimes used in dried floral arrangements.